Academy Award-winning actress and celebrated philanthropist Angelina Jolie is currently in production on Unbroken, a biopic about the remarkable life of American Olympian and World War II veteran Louis Zamperini. EW has offered up a first look at the docudrama, which is shooting on location in Australia’s Moreton Bay, where its stars Domnhall Gleeson, Finn Wittrock, and Jack O'Connell performed scene after scene on a life raft. As a boy Zamperini was a brawling hooligan, but as a teenager he channeled his frustrations into physical activities, like running. This led him to compete in the Berlin Olympics in 1936 in the 5,000 metres and 1,500 metres dash. Then, when WWII arose, Zamperini enlisted as an airman. It's this time in the hero's life where much of the film Unbroken will focus. In May of 1943, his Army Air Force bomber plummeted into the Pacific Ocean, but he and crewmates Francis 'Mac' McNamara and Russel Allen 'Phil' Phillips managed to survive. The ocean around them was littered with the crash's debris. Yet they stuck together in the life raft fighting heat exhaust, hunger and dehydration for 47 days. Their rescue came at the hands of Japanese soldiers who made them prisoners of war. For all its dark parts, however, Unbroken is not a story of tragedy, but of hope and the sheer tenacity of the human spirit. 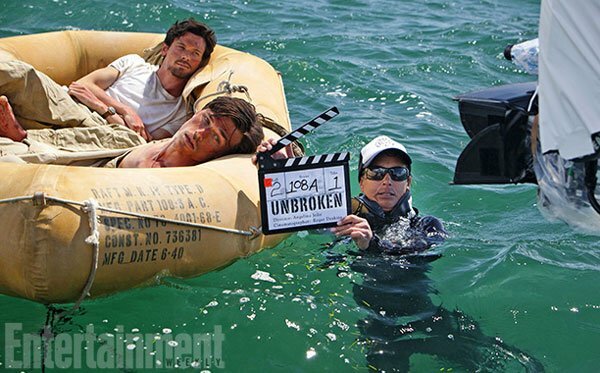 Unbroken will be Jolie's second directorial effort, following her daring debut In The Land of Blood And Honey. Rather than fronting her latest with noteworthy names or widely recognized faces, Jolie cast O'Connell, who had a recurring role in the UK teen soap opera Skins, to play Zamperini. Wittrock, a former All of Children star, and Domhnall Gleeson, who headlines the new Richard Curtis dramedy About Time opposite Rachel McAdams, will co-star as fellow survivors McNamara and Phillips. That said, all of the above are a bit hard to recognize in these photos as they were demanded to drop serious weight in order to get the emaciated look of men who'd been long-marooned at sea. "On set, we started to joke and say, ‘Tomorrow will be easier,’ knowing full well that on this challenging shoot, there are no easy days," Jolie told EW. "Anytime it gets tough, we think of the real men who lived through this, and no one complains. In fact, we all just feel honored to be here." Unbroken is on track to hit theaters in the Christmas of 2014.